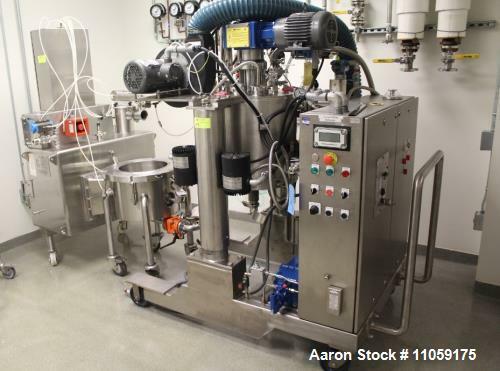 Below is Aaron's inventory of unused and used nutsche filters. 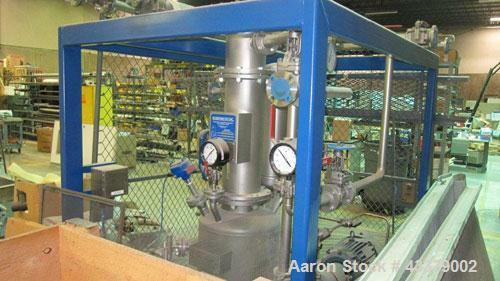 If you are looking to sell your used nutsche filter submit a request online or contact Erik Eichert at 630-238-7480. 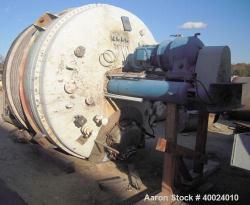 Used- Rosenmund Filter Dryer, 316L product contact areas. Approximately .2 square meter. Approximately 20" diameter x 20" straight side, dished missing bottom filter plate. 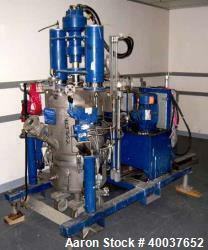 Hydraulic power pack, 5 hp. no outlet, it is a scoop out discharge. Mounted on a frame. Serial #RLP0.2-583-90, built 1990. 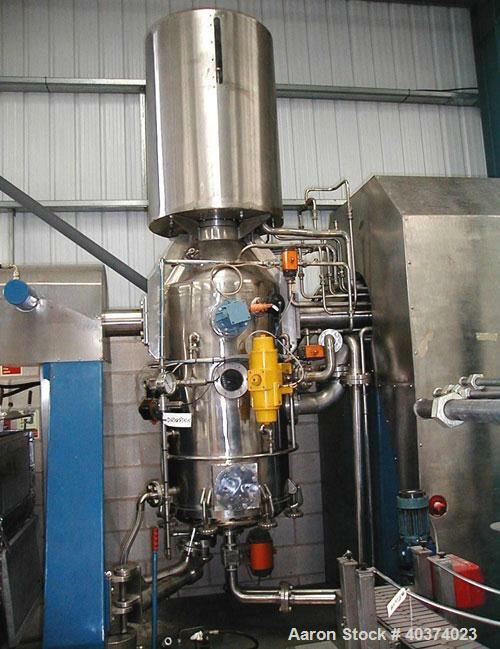 Used- GL Filtration Nutsche Filter Dryer, 0.005 Square Meter, Model FD-80. Hastelloy C22 product contact surfaces, 80mm diameter filter plate. Internal rated 6 bar and Full Vacuum at -40/+150 degrees C, jacket rated 6 bar and Full Vacuum at -40/+150 degrees C. Cored agitator rated 6 bar and Full Vacuum at -40/+150 degrees C. 0.12 kw, 460 volt agitator drive, 1 liter slurry capacity, 0.5 liter cake capacity, with PLC controls on stand with Vacuband vacuum pump, model MZ2C Vario, rated 2.5 cubic meter/hour at 9 bar, serial# C0251, new 2008. Used- DeDietrich Glass Lined Pressure Nutsche Filter, approximately 0.12 square meters, 3009 blue glass. Approximately 16" x 17" deep top section, bottom section approximately 6" straight side, dished bottom. Internal rated 100 psi and full vacuum at -20 to 500 degrees F. Carbon steel jacket rated 90 psi at -20 to 500 degrees F. Sections 1 and 2 clamp together, removable top head with davit arm. Serial #36173, National Board #6946, built 1998. 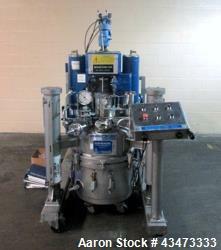 Used- Jaygo Agitated Pressure Filter Dryer, Model APF-100. 316L Stainless steel product contact areas. Approximate (.08) square meter, nominal capacity 100 liters. 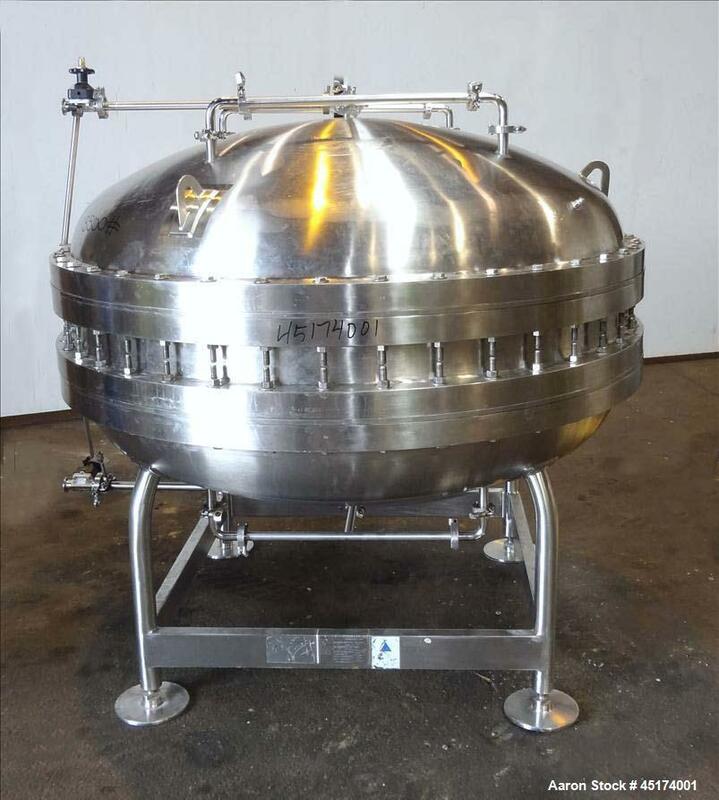 Vessel 21.15" diameter x 19" deep, internal rated 60 psi at 375 degree F, 304L stainless steel jacket rated 75 psi at 375 degree F. Dished top, dished jacketed bolt-on bottom with 1" outlet, filter screen and 3 legs with casters. 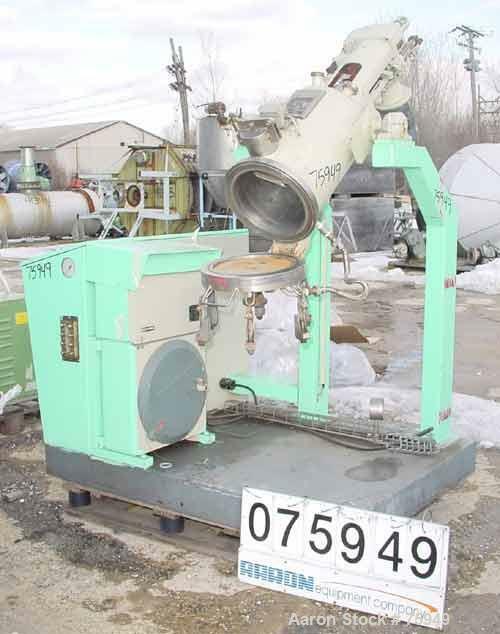 Internal wash ring, approximate 20" diameter double bottom agitator blade, driven by a 3 hp, 3/60/230/460 volt, 1755 rpm XP varispeed motor thru a SEW reducer, ratio 50.55:1, approximately 10-60 rpm, 12" upstroke. Openings: top 1/2", 3/4", 1", (2) 4" sight glass, 8" hand hole; side bottom outlet with door. 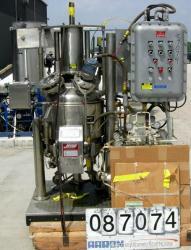 Unit includes 1.5 hp hydraulic power pack, XP control boxes. Unitized on a common frame. Used- Rosenmund RoLab 0.1 Sq.M. Nutsche Filter Dryer, Agitated. Material is ALLOY 22. Internal and jacket rated 90/FV @ 302 Deg.F (-10 to +150 Deg.C). S/N RFGD 0.1-07-40109. NB # 296. (64.5 Liter). 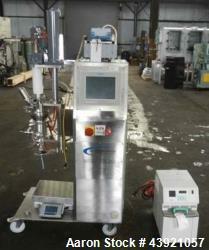 Includes Howorth Glove box Isolator with Minipurge control system. 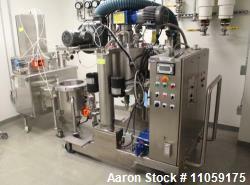 Sanitary Pharmaceutical design. approx. 18" Dia. filter vessel. Unit is rated for Hazardous Locations (class 1 division 2). 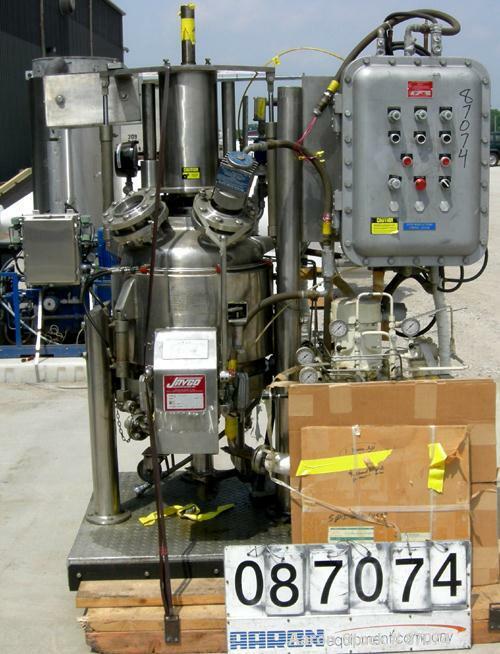 Unit ONLY Test Run with High Purity Water and then never used due to plant closure. 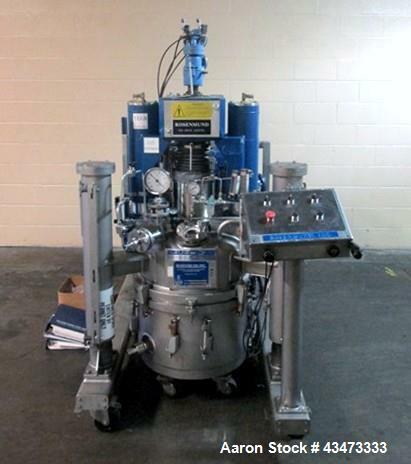 Used-APV Pasilac Thermovac Vacuum Reactor/Filter/Dryer. 316L Stainless steel construction. 0.25 m2 filter area. 23.6" x 54.7" (600 x 1390 mm) diameter. Total vessel volume 79.2 gallons (300 liters). Maximum filtrate volume 39 gallons (150 liters). Heating jacket for thermal oil ranging from -4 to 304 deg F (-20 to 150 deg C). Vessel and jacket rated for 87 psi (6 bar). Cone top and fully detachable dished base. Mounted on steel base unit, 10' x 4.9' (3070 x 1500 mm). Approximate height 11.4' (3500 mm). 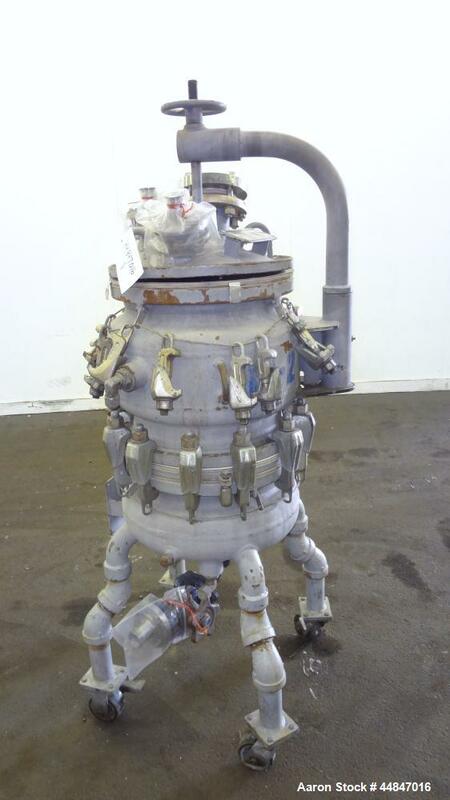 Used- Rosenmund Filter Dryer, 0.25 Square Meter, Hastelloy C22. Internal rated 50 psi & Full Vacuum at 350 degrees F. 304 Stainless steel jacket rated 90 psi & Full Vacuum at 350 degrees F. Manual discharge, hydraulically operated agitated drive, 3 wing agitator cored with rotary union, mechanical seal with bellows, 7.5hp, 460 volt XP pump, Rosenmund serial# RSD 0.25-788-94, vessel certified by Mueller, serial# 141241, National Board# 23345, built 1994. 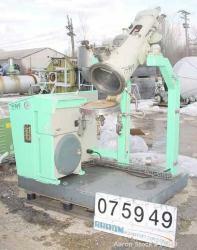 Used- Seitz-Wega Lab Size Nutsche Filter Dryer, Type EFT 30-40. Constructed of 316Ti (1.4571) Stainless Steel on product contact parts. 0.4 square meter filtration area. Total capacity is 10 gallon (40 liter). Working capacity is 7.9 gallon (30 liter). Hanging type. 12" diameter x 22" straight side (310mm x 365mm) jacketed body, rated for 45 psi (3 bar) and full vacuum (-1) at 284 deg F (140 deg C). Inside rated for 45 psi (3 atu) at 284 degree F (140 degree F) and full vacuum (-1). Complete with agitator and drive. Includes 1 control panel with hydraulic unit. Mounted on a platform. Overall dimensions: 3'9" x 5'2" x 8'1" high (1200mm x 1600mm x 1500mm high). Used- Precision Stainless Gel Filter Housing, 550 Liter, 316L Stainless Steel. Maximum capacity 3000 pounds. Approximate 63" diameter x 42" overall vessel height, dished removable top, dished bottom. Internal rated 45 psi at -20 to 300 degrees F. (2) Bed plates. (4) 1" Tri-clamp inlets, (4) bottom 1" Tri-clamp outlets. Serial# 5614-2, National Board# 4004, built 1992. Used- Cogeim 4 Square Meter Agitated Nutsche Filter Dryer, Model FPP 400 FF/D, 316L stainless steel construction, 6600 liter capacity, rated 3.45 bar (50 psi) and full vacuum at -29/+180 C internal, 1/2 pipe jacket rated 6.2 bar (90 psi) at -29/+180 C, side discharge with plug valve, packing gland, approximately 50 hp XP agitator drive, hydraulic agitator lift with pump, Syltherm heating system with (2) ITT heat exchangers and 5 hp pump with controls, serial #644, National Board #34. New 1991. Used- Rosenmund Paddle Discharge Filter Dryer, 6 square meter, 316L stainless steel. Approximately 110" diameter x 51" straight side, dish bolt on top, flat bottom. Internal rated for FV/50 psi at 20 to 370 degree F, 304L stainless steel 1/2 pipe coil jacket rated 150 psi at 370 degree F. Telescoping rake style agitator, 25 hp, 3/60/460 volt, 1770 rpm motor, center discharge. Serial #RPD6-589-91, built 1991. Certified by Gaston County, Serial #F80753-890-1, National Board #22236. Mounts on side lugs. 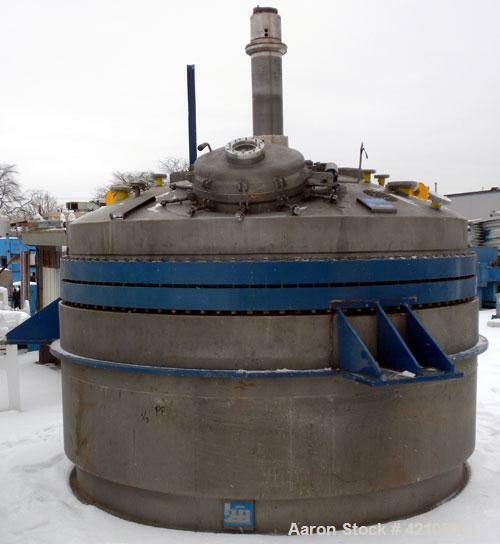 Used- Rosenmund Paddle Discharge Dryer, 6 square meter, Hastelloy C276. Approximately 110" diameter x 51" straight side, dish bolt on top, flat bottom. 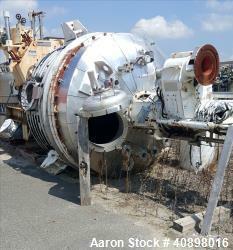 Internal rated for 50/fv at 370 degrees F, 316L stainless steel 1/2 pipe coil jacket rated 150 psi at 370 degrees F. Rake style agitator, approximately 25 hp motor, center discharge. Serial #RPD6-537-90. Certified by Gaston County, Serial #F80588-589-1, National Board #20884. Built 1990.